García grew up with politics, with his father serving as a municipal mayor for four terms. He acquired his primary education in his native Talibon, then took his secondary education in Cebu Provincial High School. Initially, he pursued his college education at Silliman University in Dumaguete City, Negros Oriental, and later studied at the Philippine Law School where he earned his law degree in 1923. Known as the "Father of First Filipino Policy", Garcia put the rights of Filipinos above those of foreigners, favoring Filipino businessmen over foreign investors, although allowing foreigners to invest capital up to 40 percent in business or industry. He was famous for his poetry in Bohol, where he earned the nickname "Prince of Visayan Poets" and the "Bard from Bohol". Garcia was among the top 10 in the Bar examinations in 1923. Instead of practicing law right away, he served as a teacher for two years at the Bohol Provincial High School prior to entering politics. Garcia entered politics in 1925, scoring an impressive victory to become Representative of the Third District of Bohol. He was elected for another term in 1928 and served until 1931. He was elected Governor of Bohol in 1933, but served only until 1941 when he successfully ran for Senate, but he was unable to serve due to the Japanese occupation of the Philippines during the Second World War. He assumed the office when Congress re-convened in 1945 after the end of the war. Garcia was the running mate of Ramon Magsaysay in the 1953 presidential election in which both men won. He was appointed Secretary of Foreign Affairs by President Magsaysay, and for four years served concurrently as Vice-President. The presidency landed on his lap when President Ramon Magsaysay died in an airplane accident in Cebu on March 17, 1957. 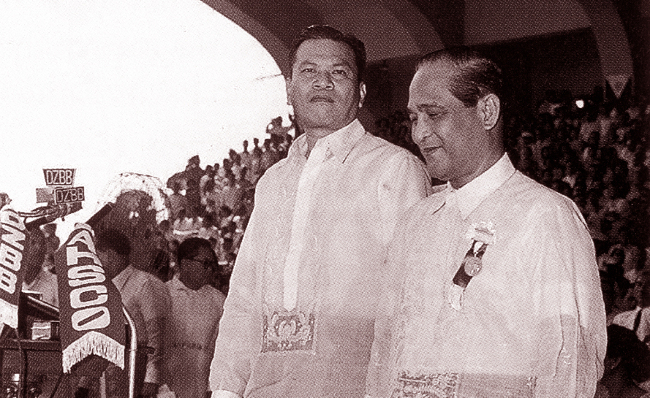 Ramon Magsaysay and Carlos P. Garcia at the Quirino Grandstand for their inauguration on December 30, 1953 (Photo credit: MLQ3 on Tumblr). 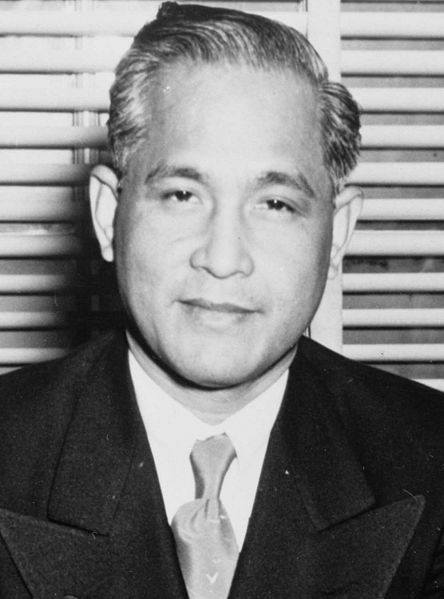 After finishing Magsaysay's term, Garcia was elected as president in the election in November 1957. His administration was characterized by its austerity program and its insistence on a comprehensive nationalist policy. His administration also acted on the Bohlen–Serrano Agreement which shortened the lease of the United States Bases from 99 years to 25 years and made it renewable after every five years. He was also responsible for changes in retail trade which greatly affected the Chinese businessmen in the country. He was also credited with reviving Filipino cultural arts. He retired to private life after failing in his reelection bid in 1961, defeated by Diosdado Macapagal, living as a private citizen in Tagbilaran City, Bohol. On June 1, 1971, García was elected delegate to the 1971 Constitutional Convention (Con-con). However, just days after his election as Con-con president, Garcia suffered a fatal heart attack on June 14, 1971. He was succeeded as president of the Convention by his former vice president, Diosdado Macapagal. García was interred at the Libingan ng mga Bayani, together with his wife Leonila, who died in 1994.